The opening hole at Glenmarnock is a beautiful par 5 playing along the coast. The modest lenght of the hole can provide an opening birdie with the helping wind. 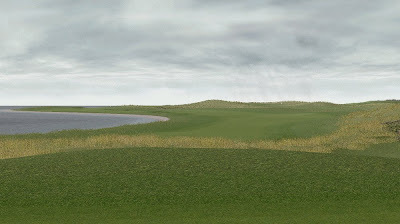 The player must negociate a double dogleg as the preferred line of play off the tee is a gentle draw around the menacing bunker to the left part of the fairway, followed by a long iron or fairway wood fading around the big dunes to reach the green. The large green is inviting and but many balls can find the back of the green which can challenge a bit the short game. Design Notes: That hole was at first a very tough, very long par 4 opener of some 470 yards with the black tee box much closer to the sea. It proved to me during testing that it was a bit too harsh for an opening hole so I built a new tee and changed the hole to a par 5. 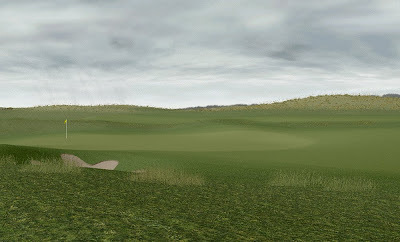 I don't usually open my courses with super challenging holes and this won't change here with Glenmarnock. With 2 solid shots the player may see an eagle opportunity right at the start of his round.